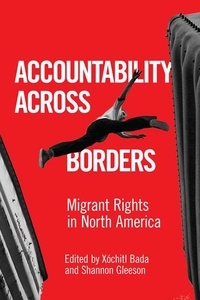 Collecting the diverse perspectives of scholars, labor organizers, and human-rights advocates, Accountability across Borders is the first edited collection that connects studies of immigrant integration in host countries to accounts of transnational migrant advocacy efforts, including case studies from the United States, Canada, and Mexico. Covering the role of federal, state, and local governments in both countries of origin and destinations, as well as nongovernmental organizations (NGOs), these essays range from reflections on labor solidarity among members of the United Food and Commercial Workers in Toronto to explorations of indigenous students from the Maya diaspora living in San Francisco. Case studies in Mexico also discuss the enforcement of the citizenship rights of Mexican American children and the struggle to affirm the human rights of Central American migrants in transit. As policies regarding immigration, citizenship, and enforcement are reaching a flashpoint in North America, this volume provides key insights into the new dynamics of migrant civil society as well as the scope and limitations of directives from governmental agencies.